Algae is considered the 3rd generation of biofuels, and several value-added products can be made from its biomass. There is currently much research going on in the field and the possibilities are many. However, the technology has yet to be established in full-scale, mainly because of financial reasons. 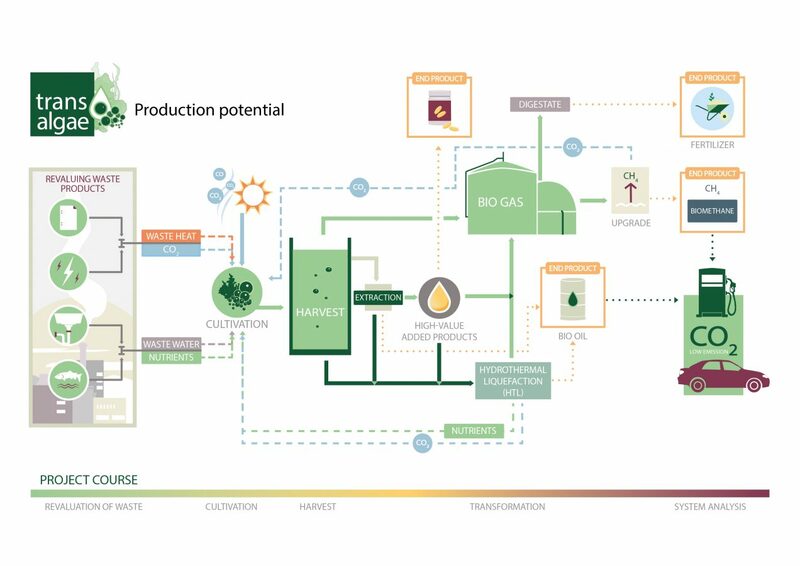 The Botnia-Atlantica project TransAlgae aims to find solutions that enable companies in the region to adopt this innovation and contribute to a sustainable bioeconomy. Currently, algae is a hot topic in research, both globally and in Finland (previous article). Despite all the advantages, it is challenging to make algae cultivation economically sustainable. Optimisation of different parts of the process or an increased lipid content are examples of routes for improving the situation. Another way is to utilize waste streams for algae cultivation, which makes it possible to get the required nutrients, while also remediating the waste stream. Currently, water treatment can be a significant cost in society. In the Nordic climate algae cultivation can be even more demanding. The TransAlgae research project aims to both optimise processes as well as make system level improvements, which can increase the application of this innovation. The Swedish University of Agricultural Sciences is the lead partner while other collaborators include Biofuel Region, Novia University of Applied Sciences, University of Vaasa, Mid Sweden University, Nattviken Invest and NIBIO. Transforming the current economy from fossil-based to a sustainable bioeconomy requires a systems perspective. We will likely need several different energy carriers in the future. Finland has plenty of forest, and the bioeconomy based on it is expected to generate jobs and revenue. However, to successfully implement the bioeconomy, it is necessary to utilise the latest generation of biofuels, namely algae. Algae can be cultivated in wastewater and flue gases, where they take up nutrients and carbon dioxide, which otherwise would be considered an economic burden. Perhaps the most critical problem in the Baltic Sea is eutrophication, which makes recycling of nutrients through algae cultivation not only convenient, but necessary for sustainability. These nutrients can be used as fertiliser in food production, e.g. by using the digestate from anaerobic digestion as fertiliser. Another advantage of algae cultivation is that it does not compete with food production for arable land. In TransAlgae, all the processes and products connected to algae cultivation are investigated, and by combining them into a system (a so-called biorefinery), remaining barriers such as profitability could be removed. If value-added products are made and certain components of the algae are extracted, there will also be waste. This waste should be utilised for both economic and ecological sustainability. This can be achieved through anaerobic digestion for the production of biogas, which can be upgraded to biomethane. This can be used as a vehicle fuel, or stored in the same way as LNG (Liquefied natural gas), which is currently seen as a promising technology in Finland. Biogas is on the rise in Finland, and algae can be beneficially co-digested with current substrates. 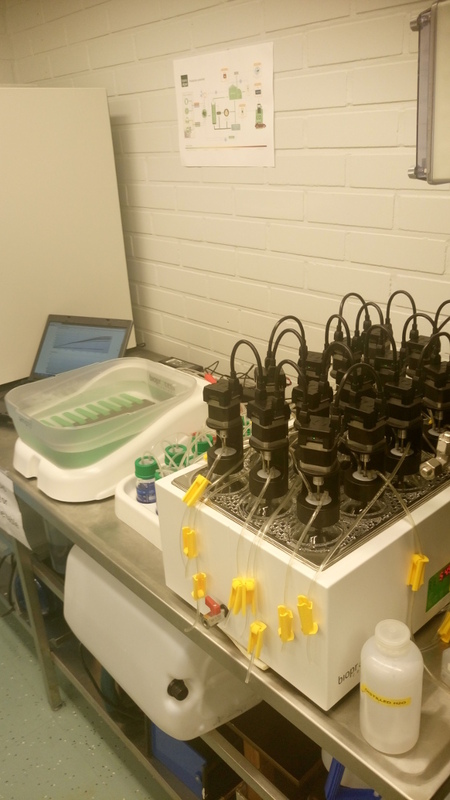 Novia UAS is investigating the biochemical methane potential (BMP) of algae that is cultivated in TransAlgae, as well as optimising the gas production through co-digestion with regionally available substrates and pretreatment methods. Regional availability is necessary for sustainability. Microalgae should be co-digested due to their nutrient composition, since they contain too much nitrogen in relation to carbon for biogas application. They should be mixed with a carbon-rich substrate, which are plenty in Finland, mainly in agriculture and the paper industry. Pretreatment should be investigated as the cell wall in certain microalgae can be difficult to digest anaerobically. Once again, there are possible synergistic effects in a system: If extraction for value-added products is carried out, it also exposes the algae to harsh treatment, which can achieve the same result as pretreatment methods. Pretreatment methods are not only a capital cost, they can negatively influence the energy balance. This, among other things, is why systems thinking is needed. In addition, after anaerobic digestion digestate remains, which can be used as a fertiliser that recycles nutrients. And so anaerobic digestion contributes to the overall sustainability and produces biofuel. In addition to anaerobic digestion, Mid Sweden University investigates Hydrothermal Liquefaction (HTL) of algae in the project. HTL can be performed practically on any biomass, and the resulting product can be altered by adjusting pressure, temperature, residence time and. The process is done at 250–550 °C and high pressure of 5–25 MPa, which produces a bio-oil that can be processed into biofuels. With a systems perspective and an eye on the surrounding synergistic effects, we can improve the economic sustainability of algae cultivation and simultaneously contribute to a circular economy. Wastewater treatment can be costly for society, but through algae cultivation it could become a resource instead. The same goes for flue gases, where the supply of carbon dioxide can be costly in conventional algae cultivation. Every kilogram of microalgae produced means 1.8 kg of carbon dioxide taken up. Carbon dioxide that would otherwise be emitted to the atmosphere in power generation, for example, can be bound in biomass. In this way, algae cultivation in waste streams with manufacturing of value-added products and energy becomes an illustrative example of circular economy. Other ways to improve recycling are also investigated, such as co-digestion with other types of waste for an improved process through a better composition of materials. Excess water in digestate can be recirculated to the cultivation. While algae cultivation seems promising, it is necessary to analyse this system and assess its sustainability. Novia UAS and Mid Sweden University will, among other things, calculate the energy balance. It looks like producing only energy from the algae is challenging, but this also depends on the value put on wastewater treatment and biofuels. As typical for circular economy, a biorefinery will always depend on its surroundings and consequently the result of the system analysis depends on local conditions.